Wednesday, April 24, 12:00 p.m. - 2:00 p.m. 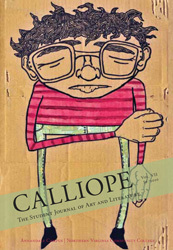 The highest quality entries are published in Calliope. In addition, these entries are automatically entered in the Languages, Arts & Social Sciences Division’s Best in Publication contest. Literary works are awarded for: 1st-$100, 2nd-$75 and 3rd-$50, in each literary category. These prizes are provided by the Division of Languages, Arts & Social Sciences. 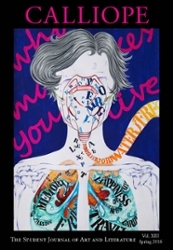 Artwork is awarded for: cover-$150, 1st-$100 2nd-$75 and 3rd-$50. The prizes are provided by the Division of Languages, Arts, and Social Sciences. 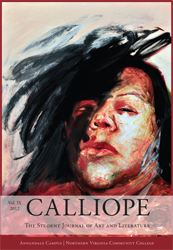 Winners are acknowledged and will read from their works at the Spring Calliope Awards Celebration in the CE Forum at Annandale. 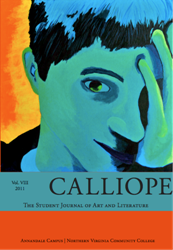 Faculty, please contact Til Turner or Adam Chiles if you would like a Calliope representative to visit your classes to explain the journal and contest to your students. If you would like additional copies of the journal or student flyers to circulate among your students, please email your request to tturner@nvcc.edu, or acchiles@nvcc.edu. Click below to submit all written entries. 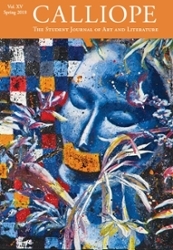 Please click below to submit all works of art including drawing, painting, design, ceramics, sculpture, and photography. Podcast - Listen to winners from the 2018 Poetry, Nonfiction, and English as a Second Language categories, as they read from their works. Podcast #1 - Listen to winners from the 2017 Poetry and Nonfiction categories, as they read from their works. Podcast #2 - Listen to winners from the 2017 Fiction and ESL categories, as they read from their works. Podcast #1 - Listen to winners from the 2016 Fiction and Poetry categories, as they read from their works. Podcast #2 - Listen to winners from the 2016 ESL and Creative Non-Fiction categories, as they read from their works. Podcast #1 - Listen to winners from the 2015 Fiction and Poetry categories, as they read from their works. Podcast #2 - Listen to winners from the 2015 ESL and Creative Non-Fiction categories, as they read from their works. Podcast #1 - Listen to winners from the 2014 Fiction and Poetry categories, as they read from their works. Podcast #2 - Listen to winners from the 2014 English as a Second Language, Creative Nonfiction, and Poetry and Prose in Foreign Languages categories, as they read from their works. 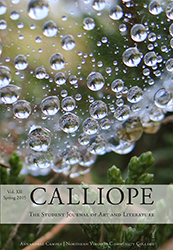 Podcast #1 - Listen to winners from the 2013 Poetry and Creative Nonfiction categories, as they read from their works. Podcast #2 - Listen to winners from the 2013 Fiction and English as a Second Language categories, as they read from their works. Podcast #1 - Listen to winners from the 2012 Fiction and Foreign Language categories, as they read excerpts from their works. Podcast #2 - Listen to winners from the 2012 Poetry and Creative Non-Fiction categories, as they read their works. Podcast #1 - Listen to winners from the 2011 Fiction and ESL - Prose & Poetry categories, as they read excerpts from their works. Podcast #2 - Listen to winners from the 2011 Poetry and Creative Non-Fiction categories, as they read their works. Podcast #1 - Listen to winners from the 2010 Fiction and Creative Non-Fiction categories, as they read excerpts from their works. 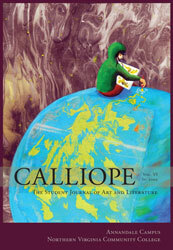 Podcast #2 - Listen to winners from the 2010 Poetry and ESL categories, as they read their works. 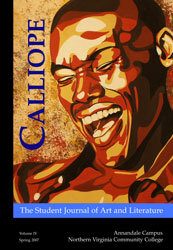 Podcast #1 - Listen to winners from the 2009 Poetry category, as they read excerpts from their works. Podcast #2 - Listen to winners from the 2009 Creative Non-Fiction category and the English as a Second Language category, as they read their works. 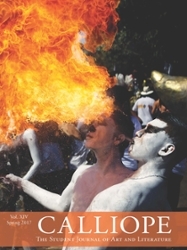 Podcast #1 - Listen to winners from the 2008 Poetry category, as they read their works. Podcast #2 - Listen to winners from the 2008 Creative Non-Fiction category, as they read excerpts from their works. Podcast #3 - Listen to winners from the 2008 English as a Second Language category, as they read their works. Podcast #1 - Listen to winners from the 2007 Poetry category, as they read their works. Podcast #2 - Listen to winners from the 2007 Fiction and the Creative Non-Fiction categories, as they read excerpts from their works. Podcast #3 - Listen to winners from the 2007 English as a Second Language category, as they read their works. We invite submissions from any student enrolled in an AN class during the 2018—2019 academic year (consisting of the Fall 2018 semester and Spring 2019 semester). 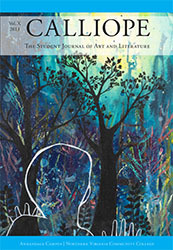 All literary and art submissions must be received in the proper format by Friday, February 15th, 2019 at 11:59 p.m.
Poetry should be no more than 2 pages in length (a maximum of 40 lines per page including stanza breaks)—individual lines of poetry must not exceed 85 characters across the page. Fiction and Non-Fiction entries can be up to 1500 words in length. All literary entries must be submitted as Word documents, single-spaced, in 12 point font (Arial or Times New Roman preferred). 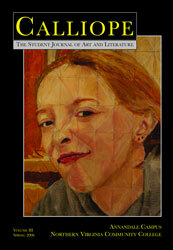 A cover page for each submission is required. See below for cover page guidelines. Works of art including drawing, painting, design, ceramics, sculpture, and photography, should be submitted to Virginia Pates: vpates@nvcc.edu. All entries must have a unique title attached to the work. 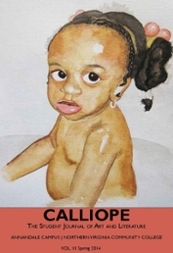 Titles for artwork entries should be placed on an accompanying cover sheet (see below). Artwork will be accepted in color or black and white. Please note that artwork should not be submitted electronically. Instead, the original, unframed 2-D work or high quality photo of the 3-D work MUST be submitted to Virginia Pates, vpatesnvcc.edu. Cover page should be a Word document, not a PDF or JPEG. Name of cover page: Last name dot first initial dot 01 (then 02, 03, etc.) to correspond with the jpeg. 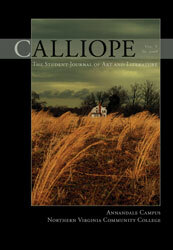 Selected submissions may appear in the Calliope publication, on the Calliope website, and in additional media as well.